Hobbyists around America enjoy the beauty offered by shiny orange, white, black, gray and speckled koi. Keeping their homes healthy and beautiful is the main goal of many enthusiasts, and luckily, putting a bit of gravel in the bottom of your pond is one of the easiest and best ways to go about this. Gravel has many uses in the koi pond. It keeps liners anchored with a natural-looking cover. It also provides a base on which beneficial bacteria can grow. Because these bacteria are natural pond filters, eating detritus from fish food and waste, giving them a habitat helps keep your pond significantly cleaner than just placing a liner at the bottom. You may also consider planting aquatic plants in your pond, using gravel as an anchor, to provide cover for fish against predators like raccoons and herons. Add gravel of a relatively small size, around three-eights to three-quarters of an inch, to provide the best growing surface for bacteria without trapping too much debris on the bottom of the pond. The material doesn't usually matter. However, gravel made of limestone can help keep ponds at a higher stable pH, though you’ll want to be careful with this. Since koi do best in pH ranges between 6.8 to 8.2 and limestone tends to push pH levels a bit higher, make sure that you either counterbalance with other commercial pH buffers to decrease alkalinity, or limit limestone in the pond. When you add gravel to your pond, use rounded gravel from rivers or gravel that has been tumbled for the purpose. Jagged rocks can damage pond liners and cause problems with drainage. Less commonly, they can also cut fish. Add only a few inches of gravel, which is all you need, and reduces the danger of raising the water level too much. Keep in mind that in bad freezes, water may freeze up to 8 inches down: make sure to leave enough room between gravel and ice for fish to survive. Of course, a single bacterial colony can only keep up with so many fish. 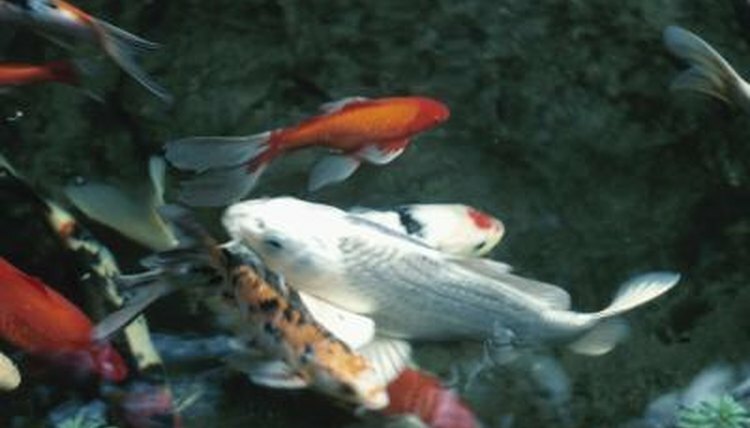 If you have maintained a koi colony for several years and your pond is starting to look crowded or cloudy, you may need a bigger home for your fish. As long as populations aren’t too high, the microbial colonies living on gravel work very effectively as a filtering medium.